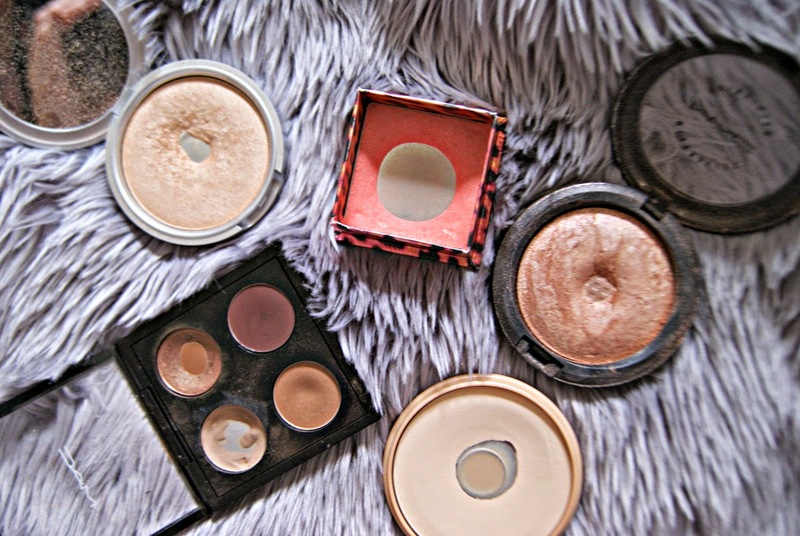 - TheBalm Mary LouManizer is a firm favourite on the highlighter front. It's so pigmented that it can brighten up my skin in an instant. I generally use this as a tear duct/eyebrow highlight as the gold tones complement the usual neutral tones of eyeshadow I generally go for. -Benefit Coralista Blush has been in my collection since before I became obsessed with makeup, and it's still in circulation today! The beautiful coral shades, with the subtle gold shimmer means I whip this out fairly regularly, but especially when I've got a bit of faux glow as it looks lovely with a tan. -MAC Soft & Gentle MSF was one of my first MAC products, a Christmas present 2 years ago. I've fallen back in love with it recently, as I love it as a cheek highlight, and I do find it a tad more subtle than TheBalm's offering. It has been a firm blogger favourite for years now, and it really is worth the hype - no other highlighter has come close to it (except maybe TheBalm's...). -MAC's eyeshadows in Omega and Woodwinked - I used Omega for a good 18 months as my eyebrow shade until Anastasia swept me off my feet, but I do find myself going back to it now and again as it's so failsafe for blondes. The ashy tones look really natural, as opposed to the red tones you can sometimes find in products for blondes. Woodwinked is the only shadow I've hit pan on for my lids, which says a lot! I only got it a year or so ago, and find myself going back to it time and time again as the warm bronze shade is so so gorgeous, and I love pairing it with Cork for a daytime look. -Rimmel Stay Matte Powder is a classic favourite. I've found myself using it more recently over my eyelids to 'prime' them in a way, as I really find it effective in keeping my eyeshadow in place. It's also such a lovely powder for really mattifying the skin, and I've been loving matte skin recently so this is something I've been reaching for more. It's also really good for a night out when shiny skin is a no no. What products have you loved so much you've hit pan on them?